Being able to play media from any computer or other devices on your TV from your smartphone or digital camera is very convenient. For example, you can walk into the house after an event, press a button or access an app and wirelessly play a slideshow of the photos you used your smartphone, digital camera, or camcorder to take. Or, you can watch a movie you just downloaded from the internet and saved on your network attached storage (NAS) drive. Again, you pick up your phone, choose the NAS drive as the source, select the movie, and tell it to play on the network media player/streamer attached to your bedroom TV. Samsung's AllShare (aka AllShare Play) was one of the first app platforms that provided this capability. AllShare was an added feature available on select Samsung smart TVs, Blu-ray disc players, home theater systems, Galaxy S mobile phones, Galaxy Tab tablets, laptops, and select digital cameras and camcorders that allowed other devices, such as TVs, PCs, and mobile devices to access and share photos, videos, and even music among themselves, streamed over any internet connection. AllShare worked when all your devices were connected to your internet router. When you were on the go, you could use AllShare with your mobile device over the internet. The DLNA (Digital Living Network Alliance) is the technology organization that created standards for connected devices and streaming media throughout the home. AllShare was an extension of DLNA connectivity. All devices using the AllShare platform were DLNA-certified in at least one category, and some in multiple categories. Let's look at the benefits each product derives from its different DLNA certifications and how DLNA makes the AllShare products work together. Samsung included AllShare in their smart TVs via two capabilities. Digital media player (DMP): Smart TVs could play media from computers, NAS drives, and other media servers on your home network. You could access the media by going to the TV's Media Share or AllShare menu, then selecting the media server and photo, movie, or music file you wanted to play. Digital media renderer (DMR): The TV showed up in the menu of a digital media controller as a device that would play media you send to it. 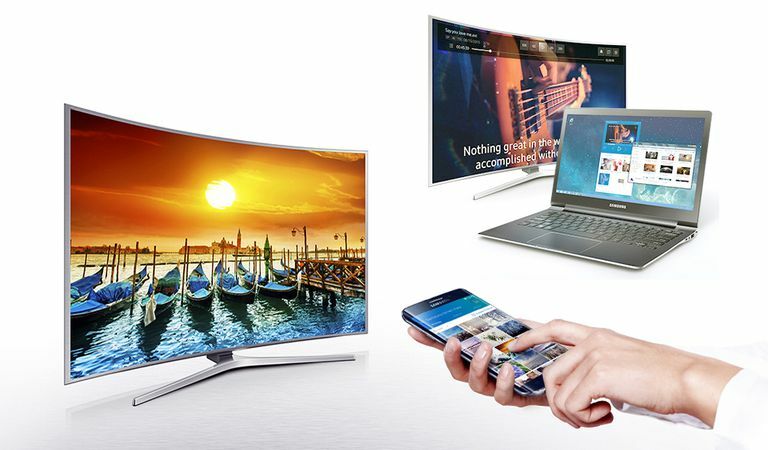 In the AllShare ecosystem, the TV could be controlled by Galaxy S phones or Galaxy Tab, or by a camera or camcorder. To play compatible media on a Samsung TV, you would select a video or music file or a playlist, and then choose the smart TV as the renderer. The music or movie would automatically start playing on the TV once it was loaded. To play a slideshow on the TV, you'd choose a number of photos and select the TV to show them. A Samsung networked Blu-ray Disc player with AllShare could connect to all of your sources to play videos, photos, and music through your home network. Samsung AllShare also worked with select Galaxy S smartphones and Galaxy Tab tablets as well as some other smartphones and tablets that used the Android operating system. AllShare functionality came pre-loaded on the Samsung mobile products. This made Samsung Galaxy products the heart of AllShare. With their multiple DLNA certifications — the Mobile Digital Media Controller certification in particular — they could move digital media around from one device to the next. They could play media from computers and media servers directly on their screens, and they could send their own photos, movies, and music to Samsung TVs and other digital media renderers (network media players/streamers and other DLNA-certified products in your network). Users could also wirelessly download and save other movies, music, and photos on their phones. And, you can upload your movies and pictures to a compatible NAS drive. Mobile Digital Media Server (MDMS): With a Galaxy S phone, you could shoot photos and videos, create voice recordings, download music, and save it all on your phone or digital camcorder. The Digital Media Server certification ensured that the phone appeared as a source (media server) in the menu of an AllShare TV, Blu-ray disc player, or laptop. From that menu, you'd simply select the desired photo, video, or recording from the list of media saved on your phone. Mobile digital media controller (MDMC): The phone's AllShare was an easy-to-use controller. In the AllShare phone app, you could choose Play file from another server to another player via my phone. Then, you could pick the source of the media, its destination (DMR), and play it. The phone played conductor, displaying your media lists, then sending it to where you wanted it to be played. Mobile digital media player (MDMP): The AllShare app allowed you to choose media that was saved on your computer or media servers, and play it on your phone. Mobile digital media renderer (MDMR): The phone was recognized as a renderer on other digital media controller devices. This allowed an AllShare-compatible controller to send files for you to watch or listen to on the phone. Mobile digital media uploader and downloader: When playing media from a media server on your network, you could upload the file and save it to a Galaxy S phone. This enabled you to access the file even if you left the house. In this way, you could take saved music and photos with you, as well as save a movie if you wanted to finish watching it after you've left home. Samsung AllShare also worked with Samsung and some other laptops. Windows 7 and Windows Media Player 12 are DLNA-compatible with software that can act as a server, player, controller, or renderer. Beyond that, Samsung added its AllShare software, "Easy Content Share," to make it easy for other AllShare devices to find the media on your laptop. Windows 7 and Windows Media Player could be used to share media, but first, you had to set up shared folders as public or shared folders so that they could be found by other computers and devices. Digital media server (DMS) compatibility: The media saved to your shared or public folders could be seen and were accessible by the players, controllers, and renderers in your home network. You could easily play any of your stored media on your TV, Blu-ray disc player, Galaxy Tab, or Galaxy S phone. Digital media player (DMP) compatibility: With Windows Media Player 11 and 12, AllShare would automatically discover and list media files from other digital media servers on your home network so that you could play them, provided the files were playback-compatible. Digital media controller (DMC) compatibility: Windows 7 had a Play To feature. You could right-click a media file and choose Play To. A list of available media players would appear. You then selected the digital media renderer — the TV, laptop, Galaxy Tab, or Galaxy S phone — on which you wanted to play the file. Digital media renderer (DMR) compatibility: Windows 7 computers that were set up to share files would appear as digital media renderers on a digital media controller device or on another computer with Windows Media Player version 11 or 12. From your smartphone, digital camera, or camcorder, you could choose a media file and play it on your laptop. What Happened to Samsung AllShare? Using DLNA as a starting point, Samsung's AllShare definitely expanded the reach of digital media content-sharing across multiple home theater, computer, and mobile devices. Samsung retired AllShare, however, and has merged its features into "smarter" platforms; the first was Samsung Link, followed by SmartView. SmartView also allows users to control and manage all of the setup and content access features of a Samsung smart TV using a compatible smartphone. Samsung SmartView is compatible with the following devices, including many that were also compatible with AllShare and Samsung Link. Just download and install the new SmartView app and follow the setup instructions for your devices. If you have an older Samsung smart TV, Blu-ray disc player, mobile phone, or computer that has AllShare or Samsung Link, it may or may not still work. If it doesn't, however, in many cases you can install Samsung SmartView and not only recover what you liked about AllShare or Link but expand your options with remote control and other refinements. The SmartView app is available through Samsung Apps for TVs, the Google Play and iTunes app stores for mobile devices (Galaxy apps for Samsung smartphones), and through Microsoft for PCs. — Disclaimer: The core content of this article was originally written by Barb Gonzalez, but has been edited, reformatted, and updated by Robert Silva and Lifewire staff. What Do You Need to Play Media on a Network Media Player or Streamer? What Is a Media Streamer?